The world's most popular products, from the iPhone to Google Search, were funded not by private companies, but the taxpayer. In this sharp and controversial international bestseller, an award-winning economist debunks the pervasive myth that the government is sluggish and inept, and at odds with a dynamic private sector. She reveals in detailed case studies that the opposite is true: the state is, and has been, our boldest and most valuable innovator. Denying this history is leading us down the wrong path. A select few get credit for what is an intensely collective effort, and the US government has started disinvesting from innovation. The repercussions could stunt economic growth and increase inequality. Mazzucato teaches us how to reverse this trend before it is too late. Professor Mariana Mazzucato (PhD) holds the Chair in the Economics of Innovation and Public Value and is the Director of the Institute for Innovation and Public Purpose, University College London. 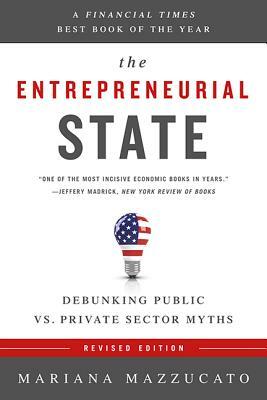 The Entrepreneurial State: Debunking Public vs. Private Sector Myths was on the Financial Times 2013 Books of the Year list. She is winner of the 2014 New Statesman SPERI Prize in Political Economy, the 2015 Hans-Matthöfer-Preis, and the 2018 Leontief Prize for Advancing the Frontiers of Economic Thought. In 2013, she was named one of the three most important thinkers about innovation by the New Republic. She advises policy makers around the world on innovation-led growth and is currently a member of the Scottish Government's Council of Economic Advisors, the UN Sustainable Development Solutions Network Leadership Council, and SITRA's Advisory Panel in Finland. Her current research projects include two funded by the EC Horizon 2020 programme, Innovation-fuelled, Sustainable, Inclusive Growth (ISIGrowth) and Distributed Global Financial Systems for Society (Dolfins), and new projects on rethinking medical innovation, funded by the Open Society Foundations, and mission-oriented innovation policies with the Inter-American Development Bank (IADB). Her recent research also includes projects funded by the Ford Foundation and the Institute for New Economic Thinking, and work commissioned by NASA and the European Space Agency. She is coeditor of Rethinking Capitalism: Economics and Policy for Sustainable and Inclusive Growth and the author of The Value of Everything: Who Makes and Who Takes from the Real Economy. "[Mazzucato] argues persuasively that a successful, innovative society must draw on symbiotic partnerships between governmental and private entities." "Conventional economics offers abstract models; conventional wisdom insists that the answer lies with private entrepreneurship. In this brilliant book, Mariana Mazzucato argues that the former is useless and the latter incomplete." "Mazzucato argues that long-term, patient government funding is an absolute prerequisite for breakthrough innovation.Even if you disagree with Mazzucato's argument, you should read her book. It will challenge your thinking." "It is one of the most incisive economic books in years." "Ms. Mazzucato is right to argue that the state has played a central role in producing game-changing breakthroughs, and that its contribution to the success of technology-based businesses should not be underestimated." "A meticulously argued treatise that shows how unwise our conventional wisdom has become." "Provides persuasive evidence that governments deserve more credit than private companies for the development of most important modern technologies." "A skillful combination of the history of technology, empirical evidence, and policy analysis--the book contains a critical reading of data and arguments that run counter to established views while never falling short of offering constructive solutions." "Makes an engaging, persuasive case in favor of the state, and suggests one recommend it not just as an instrument of market repair but also as a prerequisite for future prosperity." "In this trailblazing book on the role of government as both a risk-taking funder of innovation and a market creator, Mariana Mazzucato persuasively argues that the government is a key enabler of technological innovations that drive economic growth. This important book should be read by policymakers, opinion leaders, and others with a stake in funding economic growth." "Provides a refreshing new take on rather stale debates on the economic role of government."